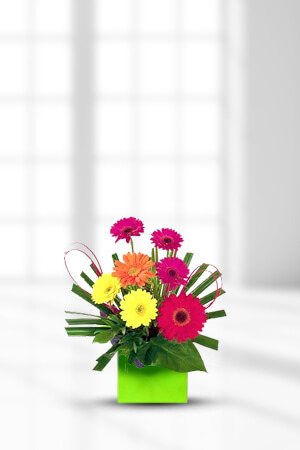 This beautiful arrangement of rainbow coloured Gerberas interspersed with Tropical Leaf, Palm Leaf and Spear Grass and decorated with creative hot pink sticks is a great way to cheer up anyone. Express your personality to someone with colour!Add to the novelty of receiving this pretty arrangement by adding a delicious bottle of Sparkling Wine to your order. It will elaborate the gift however; can not guarantee the wine will outlast the flowers! Quick And easy ordering thank you, order came the next day even though I placed order at noonish. I could not believe how efficiently the whole process was. Will surely use you again as my daughter has just moved over to live in Perth. Any the photo she send me was beautiful. Was easy to order on line, and my Daughter received her flowers by lunch time. Never having ordered flowers on internet before, I was blown away by how easy it was, the website was easy and the floral choices amazing. Delivery was 'spot on' and much appreciated. I will certainly use zFlowers.com again. Thank you, thank you. The recipient of the flowers was delighted with them! The delivery service was excellent, with next day delivery (I ordered the flowers at night). It also was easy to choose my flowers on the website. I'm very impressed with the service! Great service, especially as I put the wrong suburb on the address, communication was outstanding. Thanks for everything.